"Great dish for gluten free and vegetarian diet. Loaded with protein." 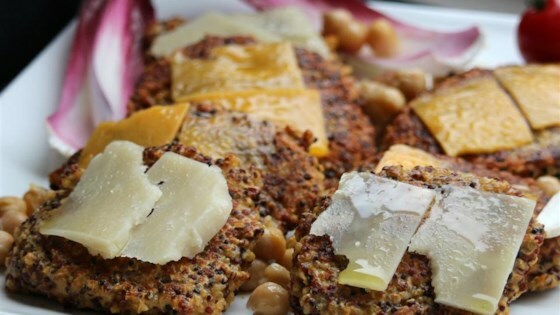 Mix quinoa, mustard, egg, garlic, and black pepper together in a bowl; add enough chickpea flour to hold mixture together to form 2 patties. Heat oil in a skillet over medium heat; cook patties in the hot oil until browned and cooked through, about 4 minutes per side. Add a Swiss cheese slice to each patty and warm until cheese melts, 2 to 3 minutes.